I try to remote debug a script which will call itself if any arguments be setted. Then I waited for the debugger to stop at line 9 and line 4, but it seems cannot be reached anymore. What I guess is it will initiate another debug connction when the script calls itself, and this connection would be processed only when the previous connections are done. According to this kind of situation, is there any good solutions? 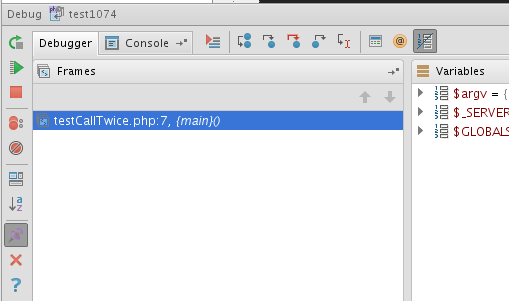 Settings | PHP | Debug | Max. simultaneous connections -- increase the value from default 1 to whatever you require (for your simple example 2 will do) -- works fine for me. You did solve my problem! I upgrade the Phpstorm to version 6.0.1 and found this option. Futher more, the "max simultaneous connections" function works fine with zero-config debug mode(press the phone like button). But I cannot accept multiple connections via press debug button(Shift + F9). However, at least it's work now! But I cannot accept multiple connections via press debug button(Shift + F9).However, at least it's work now! Yes, I did see the new sessions if I start to debug with the phone like button . But I cannot see sessions if I press the debug button to start debugging. When you start listening for debug session via Phone handle icon, IDE will accept incomming connection with ANY key. 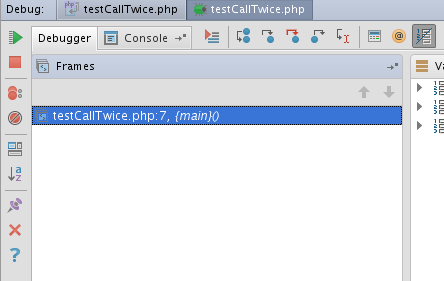 When you use Run/Debug Configuration enrty of "PHP Remote Debug" type ... IDE will accept incoming connection with that SPECIFIC key ONLY .. and it cannot launch more than one session with the same ID/KEY. Also .. the subrequest (the exec line) may simply not have IDE key at all (depends how you have configured it). Anyway -- you have properly working solution already: if one approach does not work (for whatever reason) you can always use another one. I personally always use that Phone Handle icon for web page/remote debug. Thanks for your explanation, now I know why it hangs. Maybe it will be great if Run/Debug Configuration mode can aeecpt connections with same KEY.